Want to get good on wheelies. I currently have an XR250 but in the process of moving to a 250X. That will help me, I think as the XR is only responsive to wheelies in 1st gear or 2nd on an incline. Anyway, what is the best way to practice? Up hill?, Flat? Standing?, Sitting?, High speed, Slow speed? Any tips most appreciated. Any tips on how to use the front brake to put the back wheel in the air would be cool too. Frankly, I am a little scared to do this!! tlabatte...practice on a slight but noticable incline. this does two things for you. first, it gets you closer to the 'tipping angle' before your front wheel even leaves the ground. second, it has the natural effect of slowing you down. wear protective gear, elbow and knee guards, helmet, gloves, riding pants, boots, chest protector (with back protector), kidney belt that covers your lower back. learn to keep your right foot over the rear brake and tap it as needed if you begin to over rotate. Thanks. I have never even considered the foot Brake. This is how I've been practicing my wheelies, with some success. I just got back from about 2 hours of practicing wheelies and this is what I've concluded. In like 2nd or 3rd gear get right into the meat of the power, let off the gas a little and push down on the bars, as soon as the forks are no longer compressing, maybe a millisecond before whack open the throttle and pull back. I've also found that when you pull back, the straighter you keep your legs, the easier it is to get it up high and keep it going. I have a 2004 crf450r i use for woods racing. I am trying to learn how to keep the front end on the ground. good luck with the wheel stands..
You are not riding it hard enough!! if you are good at all you can ride a wheelie in any gear, any where, just practice and you'll get better. for me i start in first and ride them all the way through fifth. and thats only on a crf150. and yea it is really hard for me to even think about havin the front tire on the ground. She says If I go ridin one more time shes gonna leave me..Im guna miss her. I flip the clutch to get the front up for a wheelie, a trick my buddy swore on, and he does the best wheelies I've ever seen, you can get the front up in any gear at any speed doing this, no "whacking" the throttle, using the clutch flip lets you keep the throttle at a steady spot, easier to control once it's up. I could never do any good wheelies before I was tought this method, use this and like Ken said, start on a slight uphill incline, easier to get use to the balance point without the front end so high. 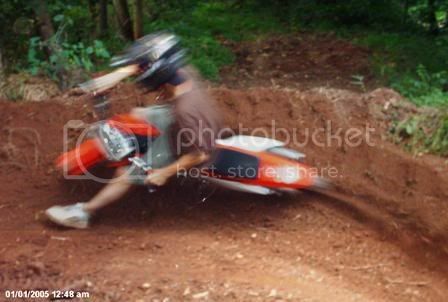 Oh, and make sure you lean way back, I used to always try to hold it up w/just the power alone and stayed forward on the bike, found out I was wrong, now I sit so far back I'm almost on the rear fender, and COVER the rear brake. 5th gear wheelies and then check out this video there are some crashes and wheelies..
im on a crf-450r right now and i havent even really thought of trying to wheelie until this bike, should i try the whole hill climb thing or what? '03 CRF-450R - Moose skid plate, Scotts stainless filter, Acerbis Rally Handguards, PMB Sparky, Zipty, BF screen removed. im having trouble doin wheelies on my 450x. i know the things got tons of power but i just cant do it. i stand up and push the front suspension in then pull the handle bars and gas it but it doesnt lift up. ive seen videos where people are sitting down on the x and they seem to do it with ease. what am i doing wrong? can u sho us the tape?